At Wellspring Camps, we’ve assembled a phenomenal team of health & wellness professionals dedicated to transforming the lives of the children, teens, young adults, and families we serve. From registered dieticians, yoga instructors, sports coaches, and nutritionists to certified personal trainers, chefs, licensed psychotherapists, and other specialists in childhood and adolescent weight management, eating disorders and body image, the staff and leadership of Wellspring Camps is ready to deliver life changing experiences this summer. Our staff are specially trained to meet the needs of campers with different fitness levels (including those who have been inactive for some time), encouraging every camper to work up to his or her potential, celebrating the many milestones achieved by our campers, and helping campers to work through their fears of new situations or challenges. They are high-energy individuals who create an atmosphere of positive summer camp fun! Eliza Kingsford is a leading expert on weight management, weight loss, eating disorders and body image. Eliza, a licensed psychotherapist and author of Brain-Powered Weight Loss has been with Wellspring Camps since 2007. Wellspring Camps uses the same holistic approach to weight loss and weight management as outlined in her new book. Eliza is also a certified personal trainer, group fitness instructor and long-time athlete. Eliza became passionate about combining therapeutic intervention, nutrition and exercise early on in her graduate studies at the University of Colorado. An experienced speaker and presenter, Eliza has appeared on various television shows (Dr. Phil, Dr. Drew and Dr. Oz), at national conferences and workshops, and in various publications. Eliza is a member of RiverMend Health’s Scientific Advisory Board and serves on various committees for the Obesity Action Coalition. Michaela has been with Wellspring since 2010 in various roles at camp and working with families throughout the year. Michaela started going to summer camp in the sixth grade and considers her experiences there and at many other camps over the years formative to who she is as an adult. She has a background in youth leadership and outdoor education as well as adventure guiding and international travel. As Director of Operations, she puts a strong focus on providing life-changing experiences before, during, and after camp. Cari is a registered dietitian and holds a certificate of training from the Academy of Nutrition and Dietetics in Childhood and Adolescent Weight Management. She graduated with honors from Miami University with a BA in psychology and a minor in nutrition and completed her dietetic coursework at NYU’s Steinhardt Graduate School. Throughout graduate school, Cari spent her summers serving as a nutrition instructor for Wellspring New York. After completing her dietetic internship at the University of Houston and attaining her RD, Cari worked in both clinical and corporate health environments, but happily returned to Wellspring in 2011 to serve as the Wisconsin Camp’s Director and to manage all of the nutrition and culinary programming for all of our locations. Cari has been interviewed by Forbes, the Chicago Tribune, Fitness Magazine, the Huffington Post, and a number of other publications and has published articles in dozens of online and print media. During the rest of the year she resides in Katy, Texas with her husband Dave and her dogs Gabe and Bergie. Kristen’s Wellspring experience began in 2012 when she landed her dream summer position at Wellspring California as a personal trainer/counselor. She has her B.S. in Kinesiology and Integrated Physiology from Hanover College. There she led her soccer team as captain as well as studied abroad in Australia for a semester. Her passion for helping others led her to personal training and then to start her own fitness studio in New Mexico. As a graduate assistant, she completed her Masters in Exercise and Sport science in 2015 and defended her thesis on a weight loss and fitness program for firefighters. During the summer of her master’s program she was the program supervisor at Wellspring Florida. Kristen came on full time with Wellspring in 2016 and ran Wellspring Florida, she now proudly runs Wellspring California. She considers herself a free spirit and is inspired by sunshine, helping people, and adventures. Born and bred in Kentucky, she is the oldest of five children, is keen on barbells, yoga, hiking, traveling, and summer camp. 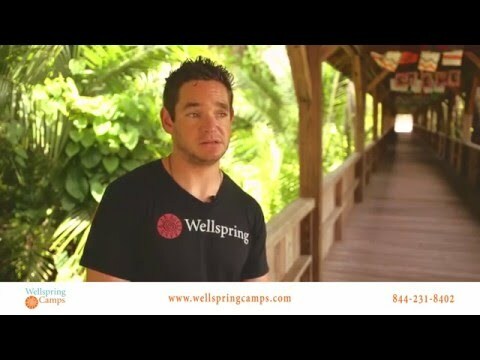 Ben is self-proclaimed guru of summer camp and is very excited to join the Wellspring family. Before joining Wellspring, he supervised several camps with the YMCA and assisted the American Camp Association (ACA) with training summer camp directors and their staff. He also served as the Athletic Director for a private sports club in NYC where he also started a club volleyball program and coached one of the teams. Ben has been a NASM certified personal trainer and CrossFit coach since 2014. He loves to share his love for fitness, healthy eating and always staying active. You can expect to see him this summer motivating the campers and staff to do their best and supporting them in achieving their goals. Ben is the oldest of 4 boys and proud to be a native Floridian. When not at camp, he is always looking for new ways to physically challenge himself and hopes to do a race on every continent. Danielle Dellner, PhD, is a licensed Clinical Psychologist who brings nearly a decade of experience working in the therapeutic setting including residential treatment for addiction, mental illness and eating disorders. During her 6-year tenure at a San Diego-based treatment facility, Danielle’s roles included Staff Clinician, Associate Director, Clinical Supervisor, and Clinical Director. Danielle has always had a passion for using experiential and outdoor approaches to help people enjoy being healthy in their bodies. Danielle is particularly proud of her efforts in bringing experiential and outdoor therapy modalities to her clients, including multi-day camping trips and establishing an Equine Therapy program. Danielle has been an athlete most of her life; she has completed a marathon and half-marathon, was a competitive gymnast throughout high school, is a lifelong skier and in her free-time, you can find her enjoying the outdoors hiking, skiing, golfing, rock-climbing and backpacking. In addition to being a National Outdoor Leadership School graduate, Danielle is a therapist for the Wounded Warrior Project and volunteers with Outdoor Outreach, a San Diego organization that provides experiential outdoor learning opportunities for underserved children and adolescents. Danielle is on the Board of Directors at the Rocking Horse Ranch, a non-profit animal sanctuary providing equine-assisted therapy to adults and children in San Diego, and is a Masters of Counseling program instructor at the San Diego campus of University of Phoenix. Danielle is known for her friendliness and humor. Her approach working with campers is to utilize person-centered and experiential methods in conjunction with evidenced-based treatment to help clients reach their goals. She is a believer that each camper has unique strengths that can be nurtured and used to support growth and healing. Jane has been with Wellspring since 2006 running our Camps in many locations before returning to the UK to take up her present role as Director of International Business Development and Sales. Jane served 9 years in the British Royal Navy and on leaving followed her passion for working with young people in the outdoors. She received her Bachelor’s degree in Environmental Science from the University of Plymouth and holds her Gold Duke of Edinburgh Award. Jane has been fortunate to have travelled extensively giving her enormous knowledge and understanding in order to help international families as they start on the wonderful Wellspring Journey. Jessica started with Wellspring New York in 2011 and has worked in various roles, including Behavioral Coach, Regional Outreach Representative, and Clinical Director for Wellspring Great Lakes. She graduated from Bradley University with a Bachelor’s in Health Science and a Master’s in Human Developmental Clinical Counseling. Throughout graduate school she implemented a health and wellness initiative called “Get Fit, Stay Fit” for Bradley University. Jessica is a Licensed Professional Counselor and a Nationally Certified Counselor with a specialization in health, wellness, and addictions. Jessica’s passion is instilling positive behavior changes within young adolescents. In free time, you can find Jessica training for her next marathon, running for Alex’s Lemonade Stand Charity. Throughout his career Ron has worked in a wide range of environments as both a regional and international account manager in both IT and Client Relations. Since joining Wellspring in 2014, Ron has excelled in working with and assisting our parents and campers. From another parent “Oh you’re the one that I spoke to on the phone. You’re the very reason that my daughter has come to Wellspring. If it wasn’t for you, my daughter would never have had this amazing experience at camp”. Ron lives in Kennesaw, Ga with his wife Chris and daughters, Katie and Madison where he enjoys family cookouts, reading and nature walks. Geeta spent three summers at camp before becoming an Admissions Coordinator. She has held various roles that include, Personal Trainer, Head Coach, and Program Manager. She received her B.S from Kent State University in Exercise Physiology. She has returned to Wellspring full time after receiving her M.A. in Exercise Behavior from The Ohio State University. While in graduate school, Geeta focused her coursework and research on children’s physical activity programs. Geeta is also an ACSM certified Personal Trainer, and loves spending time helping others get active. Her favorite ways to get moving are to play soccer, lift weights, and come up with new fun camp activities.